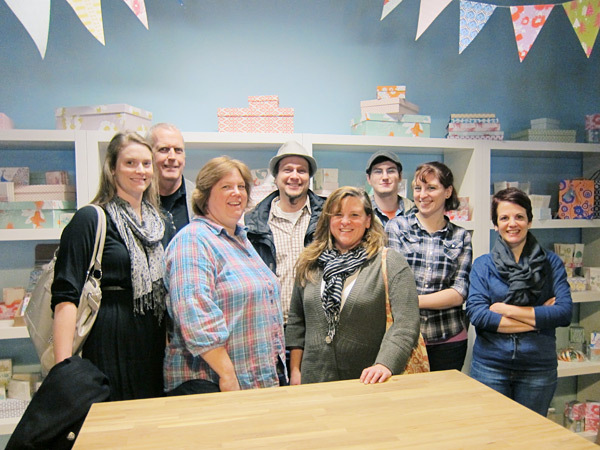 Boxcar Press started off February with a tour group from the local branch of the AIGA. These tours are a great opportunity for us to not only show what our company has to offer, but also helps us encourage and inspire people to pursue designing for letterpress projects. The group size consisted of about seven graphic designers. They showed great interest in the process from design to platemaking all the way to finishing. Everyone enjoyed watching the printers at their windmills and rubbing their fingertips over the impression in the paper. As letterpress continues to grow in popularity, we find graphic designers who visit are more knowledgeable about the craft than just a couple of years ago. A big thanks to these designers for stopping in! This entry was posted in Ephemera and tagged Boxcar Press, Boxcar Press tour, central new york, letterpress fun, letterpress print shop, New York, print shop, printing, syracuse, Syracuse AIGA by Anthony Allen. Bookmark the permalink.